I’ve made good progress with my underwater paintings this week. Starting to build up the rays of light beneath the surface and some of the ripples. Still some way to go. Looking forward to adding some bubbles, flies and maybe a wee fish or two. Progress might be slower in the next few weeks – it’s the start of trout season! Categories: Painting | Tags: fishing, fishing flies, fishing lures, salmon, trout | Permalink. Having a wee change from the colourful landscape and going back to some underwater pictures. I’ve been laying down some soft backgrounds today. This is my favourite part of painting: you feel super-productive as you can start 20 pictures at once. Check back in a week to see my progress. 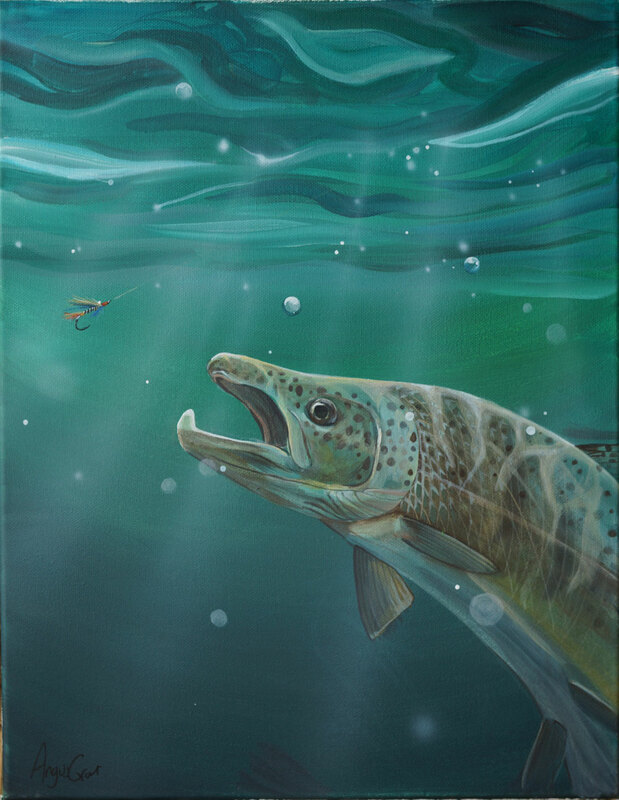 Categories: Painting | Tags: fishing, fishing flies, salmon, trout, underwater | Permalink. Rising up through the water with his eyes on a blue sapphire. What are his chances? Categories: Painting | Tags: 1896 Gallery, fish, salmon, underwater | Permalink.